Israel's Tent Protests: Whose 'Social Justice'? In my opinion, the Israeli cost-of-living tent protests are not necessarily about the broadest reaches of social justice. They are confined to how Israelis want their own society to be ordered. And whatever the borders of the Jewish state, Israel must not sacrifice democracy on the altar of ethnicity. 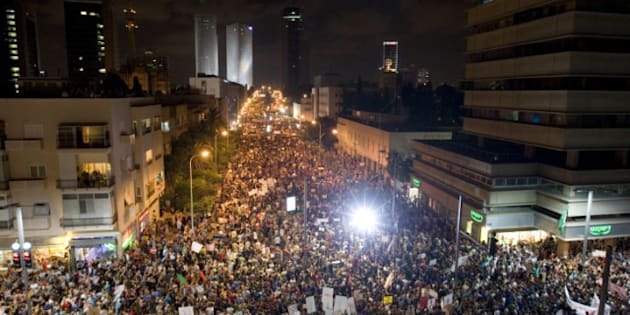 With the four-week old Israeli cost-of-living tent protests swelling in intensity -- capped by 300,000 demonstrators taking to the streets on Saturday night -- I am fascinated by the fact that the term "social justice" has become a household word. The official slogan of the demonstrations -- "The nation demands social justice!" (Ha'Am doresh tzedek chevrati!) -- involves the headiest and most ethereal of concepts. But commentators have been rightly asking whether the use of the term "social justice" is deserved. How can the nation demand social justice when areas as diverse as education, health care, child care and housing are being discussed, while Israel's policies toward the Palestinians are being ignored? To a Diaspora Jew who is used to seeing the phrase "social justice" used in the context of far-reaching, spiritually-infused debates about "tikkun olam" (repairing the world), I understand the confusion. When I hear Jewish souls talking about social justice, what comes to mind are clarion calls like that of Or Rose, Jo Ellen Green Kaiser and Margie Klein's edited book Righteous Indignation: A Jewish Call for Justice. There, the authors parse issues ranging from health care, the environment, and AIDS, to public schools, Darfur, globalization and of course Israeli-Palestinian relations. They also debate the finer points of the relationship between transformative social justice and the temporary, band-aid salve of social action. But in the Israeli case, the key to unraveling the dilemma about who exactly, is meant to be the beneficiary of this social justice, comes down to a rabbit hole of sticky definitions, made trickier due to the nature of the Jewish state. Specifically, two key words in that slogan -- 'chevrati' and 'am' -- each possess quite different meanings. In Hebrew, 'chevrati' means both 'social' and 'societal.' So, in my opinion, the protests are not necessarily about the broadest reaches of social justice. They are confined to how Israelis want their own society to be ordered. But this, in turn, requires us to ask: What are the boundaries of Israeli society? What is the role of Israel's Arab minority as well as the Palestinians in the West Bank? The State of Israel was created as a refuge for Jews fleeing anti-Semitism, and as an outlet for the Jewish people to express its collective longings by joining the family of nation-states. So while almost 20 per cent of Israeli citizens are Arab, the term 'am' cannot but connote 'Am Yisrael' -- in short, Jews. On top of this, the Israeli Knesset has recently been debating a bill that would see Arabic demoted from official-language status, while Israel's democratic status would be subordinated to that of its Jewish character. While Rothschild Boulevard burns, the Knesset is fiddling with explosive identity issues. Whether or not Israelis are consciously ignoring the Palestinian issue, the issue won't go away. And while the two possible definitions explain some of the ambiguity, the policy choice is clear. Either the demonstrations are about improving society west of the Green Line, which suggests that Israel should adjust its borders to capture its own society only, or the marchers are also demanding social justice for West Bank Palestinians. Either way, it points to the same two options: two states for two peoples, or one state for two peoples. Israelis in droves prefer the former. To achieve it, Israel must negotiate, retreat, and rethink its policies towards its own Palestinian minority. And whatever the borders of the Jewish state, Israel must not sacrifice democracy on the altar of ethnicity. The general mass of protesters has been careful not to be dragged into partisan finger-pointing. But this isn't about parties. It's about politics, policies, and personal and collective identity. The questions "what is our society," "who is the nation" and "what are the borders of our state?" loom in the background, made all the more urgent by the planned Palestinian bid for UN-sanctioned statehood in September. When the Israeli Summer crests, and the tents and sofas have been moved from Rothschild Boulevard back to the apartments which may or may not enjoy lower rent, Israelis will still be left with echoes of the most fundamental questions of Israeli national identity, Israeli dreams, and the fate of the Palestinians living in their midst.